Why You Love Magnetic Eyelashes, and You Don’t Even Know It! Since faux eyelashes were developed back in the 1920's they have stayed pretty much the same. And today, you can find that most women wear the same type of faux lashes their mothers used to wear. You know the kind I’m talking about … They come in packages and include a small container of glue adhesive that usually gets stuck to your delicate eyelids when you put them on. But today there is a new way to do luscious lashes and it’s changing beauty regimens all over the globe. I’m talking about magnetic eyelashes. Developed exclusively for a company called One Two Cosmetics, the lashes are called One Two Lash and they are the next evolution of faux lashes. Unlike anything that the beauty industry has seen before, One Two Lash makes looking pretty a snap. Literally! How Do One Two Lashes Work? Remove the top One Two Lash from the carrying case, and hold it gently by the lash end. Then place the One Two Lash just above your natural top eyelash. Position the magnetic section as close to the lash line as possible and then let go of the One Two Lash, allowing it to rest on your eyelash. Remove the bottom One Two Lash from the case (the one with the red dot on it). Holding it gently by the lashes, slowly bring the magnetic end of the bottom One Two Lash towards the top lash. You will feel the magnets pull towards each other, and ultimately snap together. When you hear the “snap,” let the One Two Lashes go and then blink a few times to secure the placement. And that’s it! There’s never been an easier way to apply faux lashes. Until now. And replacing One Two Lashes is easy too! If the placement of your One Two Lashes isn’t just right, you can simply remove them and start the application process over. 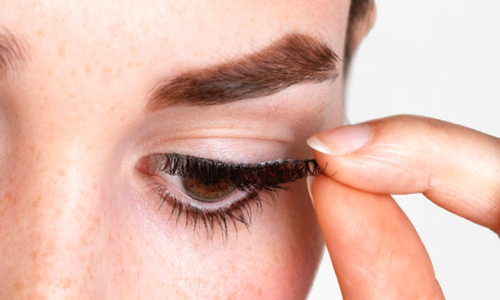 To remove One Two Lashes simply use the soft tips of your index finger and thumb and slide the One Two Lashes away from each other. This will break the magnetic connection so the lashes come off easily and all without damaging any of your natural lashes. While a trip to the lash salon will spare you from the cheap type of potentially harmful adhesives commonly found in store-bought faux lash kits, it is also a much pricier option. Usually, just one trip to the lash salon can cost up to $200.00. And that doesn’t include the maintenance phase, which can add another $100.00 to the monthly cost of a full lash set. With magnetic falsies from One Two Lash, now anyone can get the long glam lashes they’ve always wanted without the use of glue, or the hefty price tag of a lash specialist. Plus, there is never anything to worry about when it comes to your own lashes. One Two Lash magnetic extensions are completely 100% glue-free so you’ll never rip, tear or break your natural lashes. Long lashes that flutter when you blink no longer require painful application, eye damage, or expensive sittings at a lash salon. Now you can apply glamorous eyelash extensions right at home without glue or metal application tools. Just gently place the magnetic One Two Lashes above and below your natural lashes to sandwich them together and you’ve got the same lash look of your favorite celebrities. It’s that easy! Beauty editors are calling One Two Lash magnetic extensions a “beauty game-changer” and they’re right! Never before could you apply a high-quality set of faux lashes at home without any harmful glue and get them perfectly set every time. But with One Two Lash, you can apply and reapply them as many times as you need to in order to get the placement just perfect. So, get the hot new beauty product that is changing the way women do lashes, and get noticed! One Two lashes give you the look that gets lash envy. 1. Amano Y, Sugimoto Y. Ocular disorders due to eyelash extensions. Cornea. 2012 Feb;31(2):121-5.